Q: Tell us a little about yourself and your designs. How long have you been creating? Like most of us, I've been artsy-craftsy since an early age. I was that kid who was forever building and decorating the playhouse, and never playing in it. My mother remembers me, as a 4-year-old, drawing on her white leather armchair. She didn't much appreciate this early venture into multi-media, but I remember that the look and feel of the dark blue ball-point on leather was AMAZING. I still kinda think so. But, in 1979 computers found me, and I spent many years exploring what can be done with a pixel. Computer graphics was still a very young field then, and Pong was still the best video game around. I was there for the first Macintosh, and before that, for the first color screen. Technology has come a long way. Over the years, art was always in the background. I painted, made my own jewelry, and later my own handbags. My family and friends liked the handmade presents I gave them, and they encouraged me to sell my things in stores. But I could never figure out how to insert myself into the business side of arts and crafts. Then, last summer I discovered Etsy and I realized that there was a way for me to see if my work was marketable. Q: Where did the idea for your designs originate? Wouldn't I like to know. I usually start with a idea for a certain shape or structure, and then I embellish it from there. My Happy Monster backpack series started out as a sort of personal challenge to see if I could create a very simple purse pattern that used a minimum of materials and tools. I wanted it to be something that anyone with a beginner's level of sewing skill could pick up and make. So, no buttons, grommets, rings, snaps, or zippers. No interfacing or special fabrics either. What I came up with was my "sew-easy fashion backpack" pattern. I posted it on Instructables last year. http://www.instructables.com/id/Sew-Easy-Fashion-Backpack. Q: What makes your items different from others? Each monster is individually designed. Putting together their little faces is the best, most creative part of my process. During that time, the monsters and I form a self-reinforcing, reciprocating loop of artsy happiness. That way, when the monsters are transferred to their new people, they are ready to automatically generate a new loop of happiness, triggered by that first smile. Q: Do you offer custom orders? Absolutely. My monsters may bite, but I don't. Almost everything can be custom made in a different size, color or style. Monsters bags are being used by boys and girls, college students, moms and kids of all ages. The right of the people to keep and bear Monster Bags shall not be infringed. Q: What are your most popular items? The Monster Minis (for iPhones, cell phones, cameras, makeup, etc) are really convenient, and a good introduction to the pleasures of Monster ownership. They come in lots of fabrics and styles. I have a bunch in stock right now. Q: What is your vision for your handmade business? Well, it's not about making money for myself. Nearly all of my Paypal funds are used to make small business loans to women in developing countries. So far I've made loans to over ninety women in Africa, South American and Asia. See details. But besides that, I really like getting views and hearts and nice feedback. 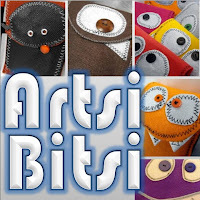 I love that there are ArtsiBitsi bags on the streets of Beirut, Kuala Lumpur, Melbourne, London and San Francisco. That sort of connection across culture and distance is breathtaking. It makes the world feel smaller, and it gives me hope that someday we might really be a united world. Q: What has been the strangest/weirdest experience you've ever had when being inspired with a new item or new business venture? The weirdest experience has been finding out that people think that the Monster Backpacks are for children. It honestly never occurred to me that people would buy them for their kids. In my mind, a Monster Backpack is the kind of fun that only really cool adults can appreciate. I guess I didn't realize how sophisticated a five year old's tastes could be. Q: Where else can your products be found? Monsters have invaded two stores in Ohio: "Open Door Art Studio" (in Columbus, Grandview and 3rd) and The Market At Serendip (in Powell). Their websites are atwww.opendoorartstudio.org and marketatserendip.com. You should try to visit them. I also have an online storewhere you can buy tees, hoodies, totes and other items with my art on them. Q: Are you a member of any organizations or have any affiliations? I'm really happy that Etsy encourages teams. Being a part of an Etsy team has been a great way to get support and learn from others. I'm a core member of Etsy Team Columbus and I'm also a member of MonsterEtsy. Q: Do you have a website off etsy, a blog, myspace, face book, plurk, twitter, any other web site you would like to share? I have a fan page on Facebook where all of my various feeds are consolidated. Plus I've posted some extra images and posters that you can download to print. You can check it out here. 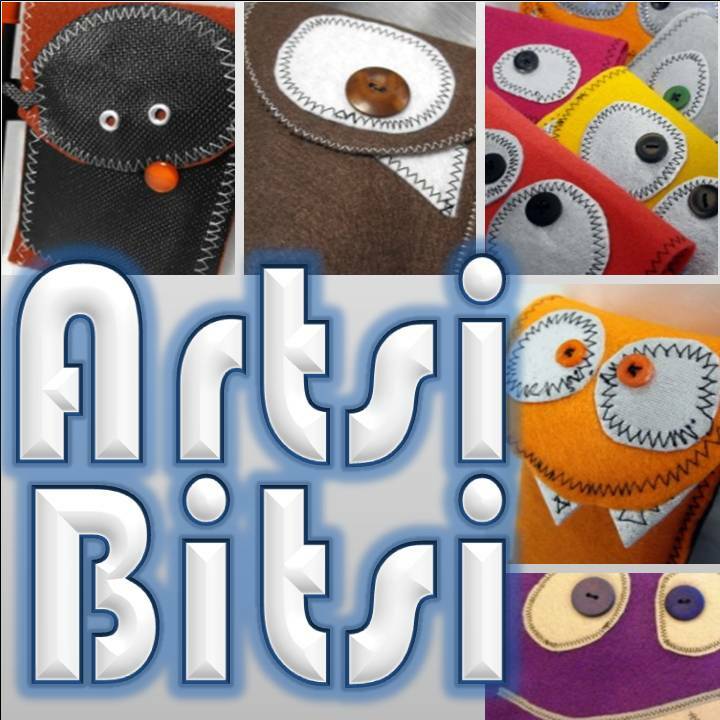 This weeks interview is with ArtsiBitsi, you can find her work at ArtsiBitsi.com and ArtsiBitsi.etsy.com. Get in touch on Facebook and Twitter too. Hi. I'm Artsi Bitsi. 'Bits' to my friends. That's you, right? So, I see monsters everywhere. It's like I'm like the Monster Whisperer. The monsters in my head tell me what to make, but it's me that always makes sure that it is both fun and functional. I have an old 1970s White model 999 sewing machine that I call Blanche. Some days she doesn't want to work, but then I remind her that the Social Security Administration doesn't pay benefits for unemployed sewing machines. Sometimes I dance with scissors. Q #1: When did you start your handmade business and what inspired you to do so? the shop owner. So being in charge of my own success was really attractive. The immediate feedback of the online marketplace is also very appealing. For example, I started out selling these lovely little watercolor paintings -- very serious, but not at all distinctive. After a few weeks of that, I started listing some of my purse designs. Again, it was the sound of crickets. After two months of experimentation, I designed my first monster bag. As soon as I listed it, it got a very positive response, so I made another. If it had not been for Etsy, I would probably still be painting watercolors that nobody wanted. Q #2: Do you have to balance your business with work, children, both? How do you do it? I'm pretty lucky to have a job teaching computer science classes at the university, which gives me a lot of flexibility. When I'm not teaching, I'm pretty free to organize my time however I want. When things are slow at work, I do sketches or cut out pieces of felt for my next project. My only daughter is grown up and living in Chicago, but she is still very interested in my ArtsiBitsi store. I often ask her for feedback on my new designs. Q #3: What is your usual work day like? studio (across the hall) and tinker around for a hour or two with felt and buttons and such. In the afternoon, I'm at the university teaching my courses and meeting with students. not completely mentally immersed in machinery all the time. Q #4: What is your favorite thing about running your business? I love the autonomy and flexibility. Being able to sell my designs means that I can create lots more. Its really hard to rationalize making one more monster when your spare bedroom is already full of monsters. But if I sell a monster, I've got room to make another! Q #5: What is your biggest challenge? Even though I have an MBA, its been a challenge translating all of that book-learning into practical action. But it's a wonderful puzzle, and I really enjoy tinkering with my designs and my site and discovering what people like about shopping for handcrafts online. Q #6: How do you market your business? Another strategy that is starting to pay off for me has been curating treasuries. Its great how Etsy has opened up the treasury application so that everyone can make one, whenever inspiration hits. I think that treasuries are going to revolutionize how people shop on Etsy, particularly since the introduction of tags. There are lots of gift guides going up now and they've just been a fantastic way to see undiscovered and original work. I've also been participating in treasury contests and recently I've been seeing more site visitors coming from those. Q #7: What is one mistake you've made in your business that you've learned from? Just one? Seriously, its a slow month if I haven't goofed it up a couple times. For example, I have introduced dozens of designs that have just completely flopped. Want some iPhone pouches shaped like Marilyn Monroe's Lips? I have them in pink and red. Cheap. For another example, I sent a bunch of stock to a consignment shop in another state... only to see my stock, and the shop, completely disappear. Lesson learned: for non-local stores, its wholesale only. And then there are the kinds of mistakes that come from just not paying attention. Like the buyer whose address was slightly different on her PayPal account from her Etsy invoice. I didn't see the difference, and her package spent several weeks in USPS limbo trying to find her. Lesson learned: double-check everything and use delivery confirmation. Q #8: What has been your biggest success and why do you think it's been so successful? You probably mean what product has been the most successful, but when I read this my first thought was, 'still being here is my biggest success.' That is to say, my backpacks have done well and I've gotten some pretty big wholesale orders for them. And the journals are popular. And sales of the pouches are steady, so that's good too. some way of making the business more entertaining -- for me. Sometimes that means coming up with a new design, and sometimes that means mastering some new technique, or finding a creative way to promote myself. Everything I do has to make me happy first, or else it won't make my customer happy. Q #9: What is the one thing you'd most like to tell someone just getting started? First, find a team and join it. Heck, join a couple. Having a support group is really helpful, particularly having a support group of people who can help you find resources and give you feedback. Second, find someone to emulate. Notice how they organize their listing descriptions and compose their item photos. What kinds of things are they doing to promote themselves? Role models and mentors are very important. Third, read everything. There are tons of useful articles on Etsy's Storque. But there are also thousands of bloggers posting great advice and motivation every week. Read and reflect and let yourself be inspired. Q #10: What goals do you have for the future of your business? Well, my first goal is to keep having fun, so that I can pass that fun along to my customers. But I would also like to diversify my product line to include monster prints and cards over the next year. That's kind of a scary transition to make because it would mean having to find a completely new audience and market. Also it will take a lot more upfront time and effort to do the artwork. Hopefully I will figure it out before next Christmas, otherwise I will be giving everyone in my family cardstock gift packs. lol. Q #11: Anything else you would like to tell the readers? Being a professional artist means something different to everyone. Some people are trying to make a living, and some people are trying to get a message out there, and some people are just trying to share their hobby. Figure out what this business means to you, and what you have to offer that is unique, and don't get pulled in some other direction just to go along with the crowd. Fill every day with art and adventure and you'll always be a success.